New Elf on the Shelf idea: What a great idea Elf! He brought a stack of wrapped books, one for each night from now until Christmas. Some are old and some are new. Pick a book each night to read in front of the tree. 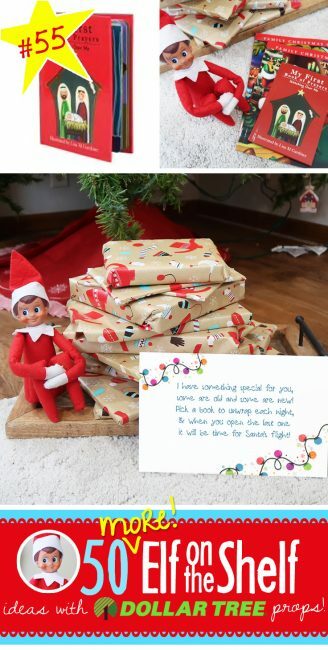 We love that our Elf on the Shelf is encouraging the kids to read more this Christmas season. Pick out all of your favorite winter and Christmas themed children’s books. We also grabbed a few more from the Dollar Tree. The kids were so excited when they opened a new book. Those books usually got read a couple times that evening!